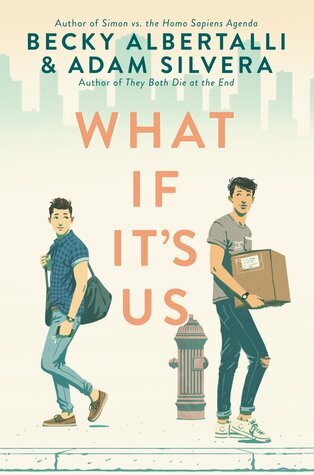 Even though I enjoyed reading What If It’s Us? I can’t give it only three hearts for various reasons. It’s a great read, but completely not my kind of read. I give What If It’s Us? by Becky Albertalli and Adam Silvera three out of five hearts because it was completely not a read for me and it left me with a lot of mixed feelings. I think Adam Silvera’s and Becky Albertalli’s writing mix very well, but the fun I saw in Adam’s They Both Die in the End was nowhere to find and I am not the biggest fan of Becky’s work either. I missed the humor a lot. The characters were both pretty different from each other but in ways also very similar. Which was odd since Arthur is written by Becky and Ben’s done by Adam. This is where some of my conflicted feelings come from. Another thing I didn’t like was that it really was about the romance and those two boys fell way too hard for each other from moment one. I have been in a sort of similar situation and when I went for it, it also ended well. But I didn’t this hard. It’s impossible. That they try and find each other is possible, I mean I did it too. But Arthur feels so desperate to find Ben that it becomes weird and unconvincing. The good thing about this novel was the well-written friendships in it. Ben’s best friend seems great and they care for each other visibly. The same goes for Arthur’s work friends. It is good to see that at least that what both authors still do very well. Overall I think that if the story had been written differently it would be better, but I wouldn’t read it again because it is just not my read. I was willing to give it a chance because of Adam and Becky’s writing, but I had a hard time pushing through. This entry was posted in Book Review and tagged Adam Silvera, Becky Albertalli, Book Review, Contemporary, Drama, Romance. Bookmark the permalink.